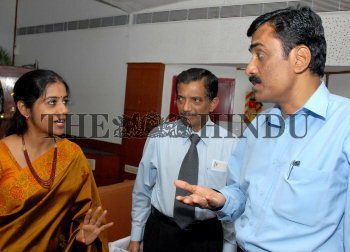 Caption : CHENNAI : March 03, 2007 : Seen (from left) Dr. Kausalya Nathan, Corporate Wellness Consultant, V. Swaminathan, Former President of Indian Association of Occupational Health Physicians and B.G. Menon, Executive Director, ACME Consulting at the Occupational Health and Safety Management Seminar in Apollo Hospital in Chennai on March 03, 2007. Photo : M_Vedhan.